The bestselling author of How to Fall in Love with a Man Who Lives in a Bush returns! When life gives you lemons, you make lemonade, right? Or you break in to a cabin to steal booze, and surprise your BFF by stripping the wallpaper off the walls of her country house - a job half done, really - and missing what could have been an important step in your career because of a really obstinate dog. But who said acting a bit loony at times is any reason to be dragged away in a strait jacket? Maya’s career as a stand-up comedian isn’t going that great. Thinking about it, life outside of work isn’t exactly stellar either, so when she finds herself on a psychiatric ward, she has some hard truths to face up to before she can find the road to recovery. Following the huge success of How to Fall in Love with a Man Who Lives in a Bush, (over 100,000 copies sold in Sweden alone) Emmy Abrahamson returns with her trademark wit in this quirky, funny and heartfelt story about daring to go your own way, even when the going gets tough. 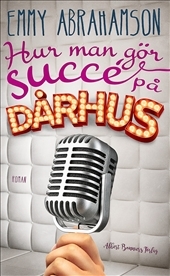 A Swedish, female equivalent of sorts to David Grossmann’s A Horse Walks into a Bar and recommended reading for fans of Eleanor Oliphant is Completely Fine and The Girl With the Lower Back Tattoo.